FSU Adjunct Professor of Printmaking and Print Lab Manager Amy Fleming was awarded a grant from The Puffin Foundation Ltd. for “The 60 Years Project,” a portrait series that works to change the narrative on aging and ageism. The Puffin Foundation provides grants to artists whose work addresses social issues, or who may be excluded from mainstream opportunities due to race, gender, or social philosophy. Ageism is a byproduct of a hyper-consumerist mindset: the disposability of mass-produced goods and the replacement of “old” with “new” without regard to quality or continued usefulness. 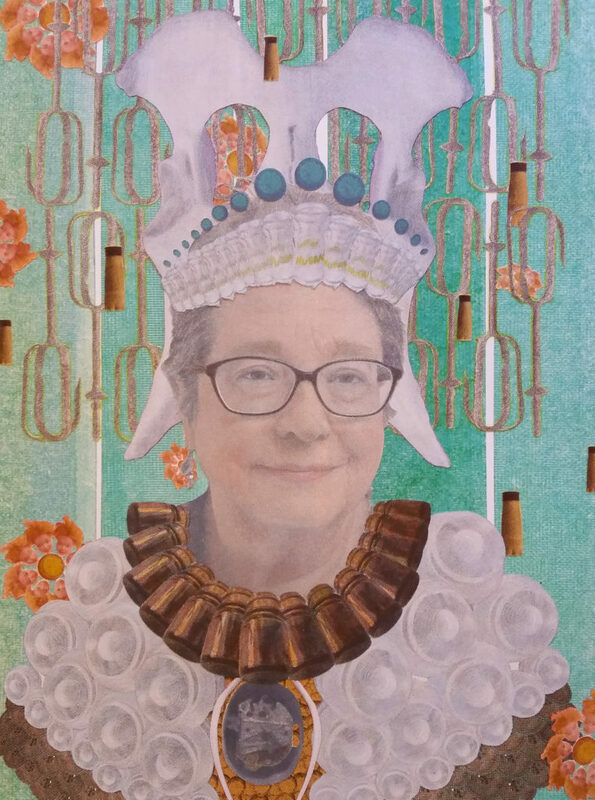 In “The 60 Years Project” images of mass-produced discards find new life as impossible robes and royal collars assembled from pump valves and vacuum tubes. Pull-tab rings reappear as chainmail; soda bottles form crowns and halos. Amy has been working with members of the City of Tallahassee Senior Center to create this series of screen and relief printed portraits. Participants in the project range in age from 60 to their mid 90’s. She became interested in problems facing older adults when two family members were dismissed from their jobs when they entered their sixties, despite having excellent work records. One is still having difficulty finding full-time employment. The first exhibition, “The Age of Experience: We Tell Better Stories” is coming up this December at FSU’s Claude Pepper Center at 636 West Call Street. Senator Claude Pepper, D-FL, served as chair of the United States House Permanent Select Committee on Aging from 1977 through 1983. Pepper led the fight against elder abuse, established legislation to fund Alzheimer’s research and care centers, and pushed energetically against age stereotyping.